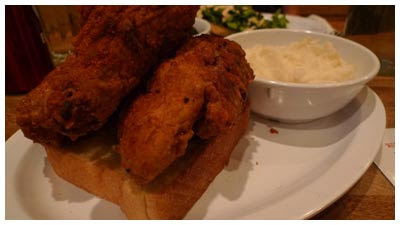 With upcoming travel plans to Nashville happening soon, I was quick to track down newcomer Peaches HotHouse in Bedford-Stuyvesent, which seems to be getting positive coverage for one of Nashville's most famous dishes: Hot chicken. We asked for this Nashville hot chicken ($12, below) to come "the way it's supposed to be" and expressed our ability to eat spicy things. 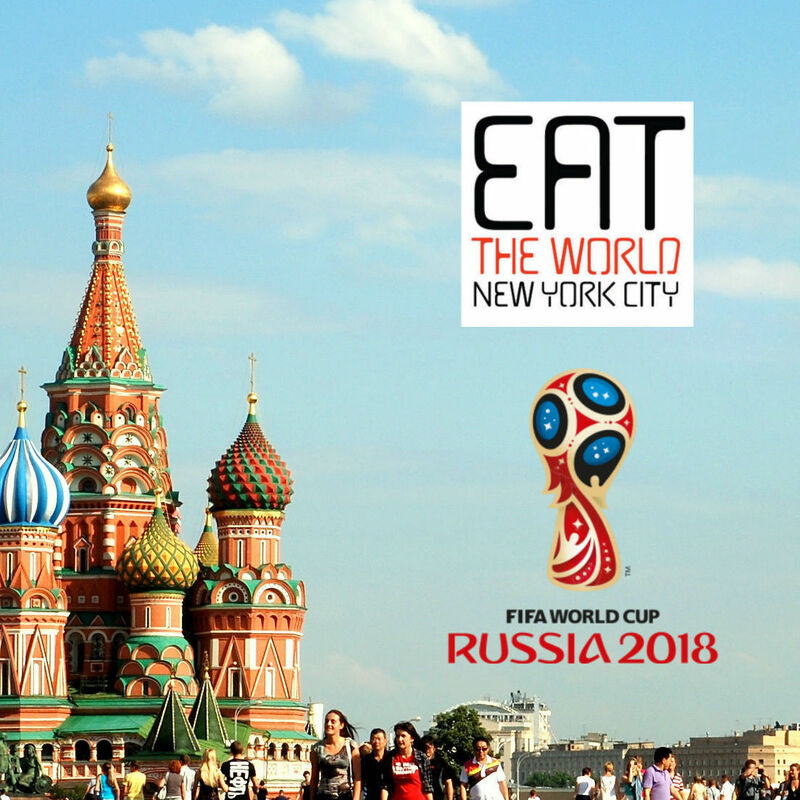 As expected, things moved a little slower than normal New York City pace [UPDATE 25 October 2014: This is no longer the case, the restaurant does a brisk business and hurries everything], which we were fine with given the nice setting to relax in. The bare woods and Earth tones let you enjoy your drinks (try the delicious lemonades!) while waiting. What came was not especially spicy, unfortunately, but extremely enjoyable. The crispy-fried perfection was served on top of a thick slice of egg toast, and while not setting your lips on fire, it did have decent kick. I guess next time I would insist on having it hot instead of politely requesting it. The menu is one page and very approachable, but offers enough to satisfy most moods. 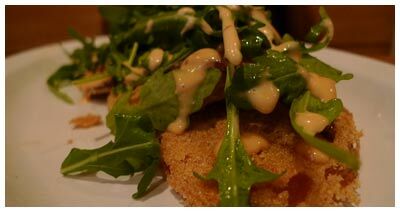 We went with the fried green tomatoes ($7, below) which are served with bacon and barbecue aioli, a dish that lived up to its tempting description. The mashed potatoes ($3, above in chicken photo) were all you could ask for and were so creamy and moist that gravy was rendered unnecessary. The collard greens ($3, below) were standard. Peaches has a decidedly neighborly feel to it, and was very welcoming as you might expect southern hospitality to be. It is definitely the type of restaurant you find yourself going back to more than expected.